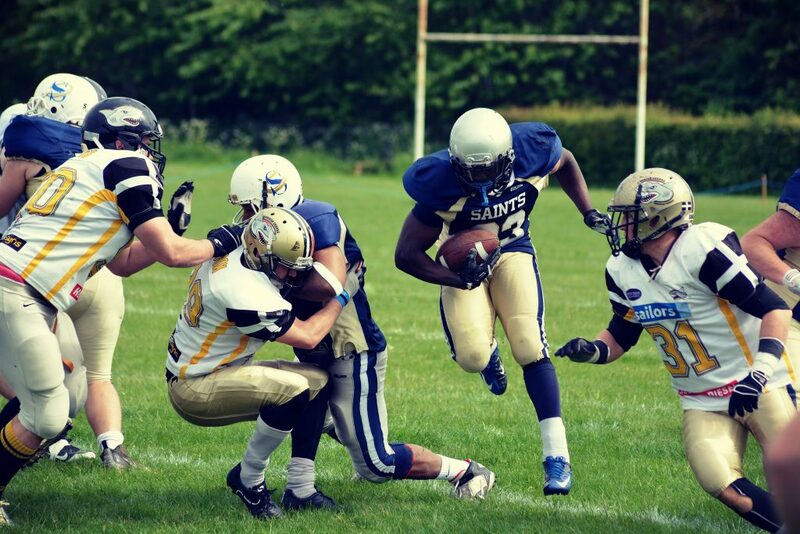 On Sunday 17th May, the Oxford Saints hosted the Cornish Sharks and defeated their old rivals 43-24! Going into this contest both teams were coming off defeats. 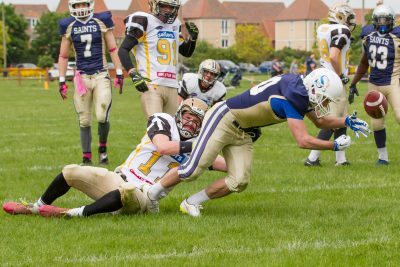 The Saints suffered a beating from the Swindon Storm on 3rd May, whilst the Sharks hosted the Bristol Apache on 9th May and went down 30-10. 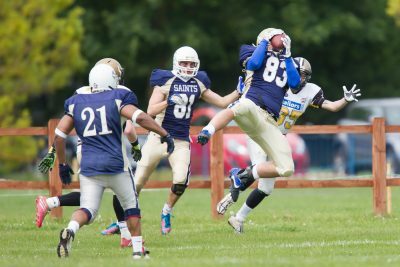 With a week of practice to fix the mistakes, the Saints bounced back when they hosted the Sharks at Abingdon Rugby Club. 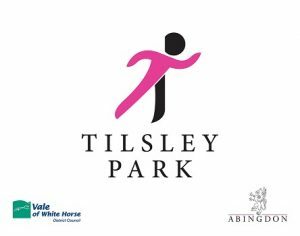 Guest of honour at the game was 10 year old Billy Taylor. 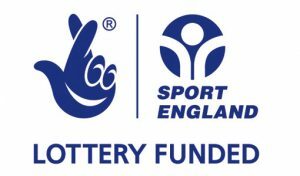 The team were thrilled by Billy’s passion for the sport when he sent a letter to us about how much he wants to play the game. He was invited to go onto the field with the team captains before kick-off and perform the coin toss. Wanting to be a wide receiver when he is older, the team presented him with a Oxford Saints t-shirt with the number 81, for veteran Saints receiver Sam Armstrong. In front of a large Oxford home crowd, the Sharks received the kick-off and had a difficult start. The Saints defense were a dominant force from the beginning of the game and featured 5 rookies with starting spots on the unit. These new players fitted in well and immediately pressured the Sharks’ offense. 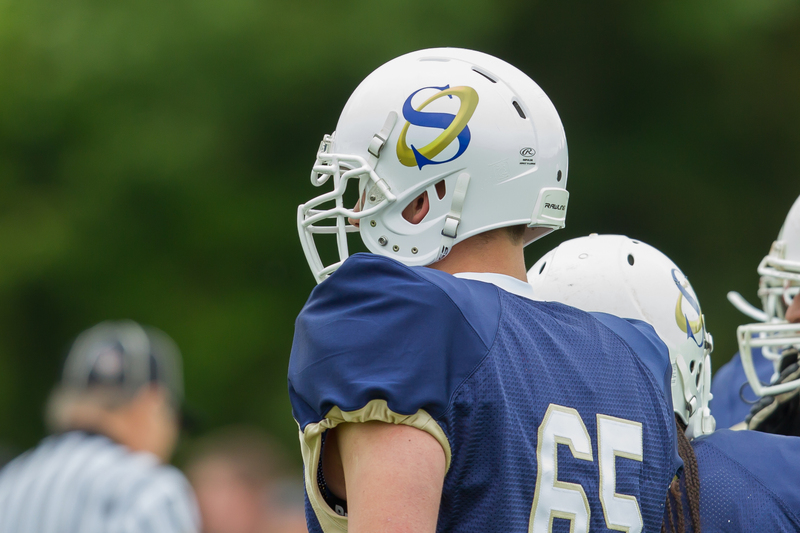 Rookie Connor Day started at the challenging middle linebacker position and had a big game, racking up 5 tackles. After struggling to move the ball, Cornwall had no choice but to punt it away on 4th down. A bad snap meant the ball flew over the punters head and rolled into the endzone. 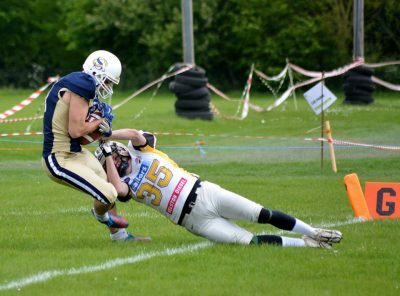 As the Sharks’ punter ran to try and recover the loose ball, he was quickly chased down by Saints defenders and tackled in his own endzone, resulting in a 2 point safety score for Oxford. 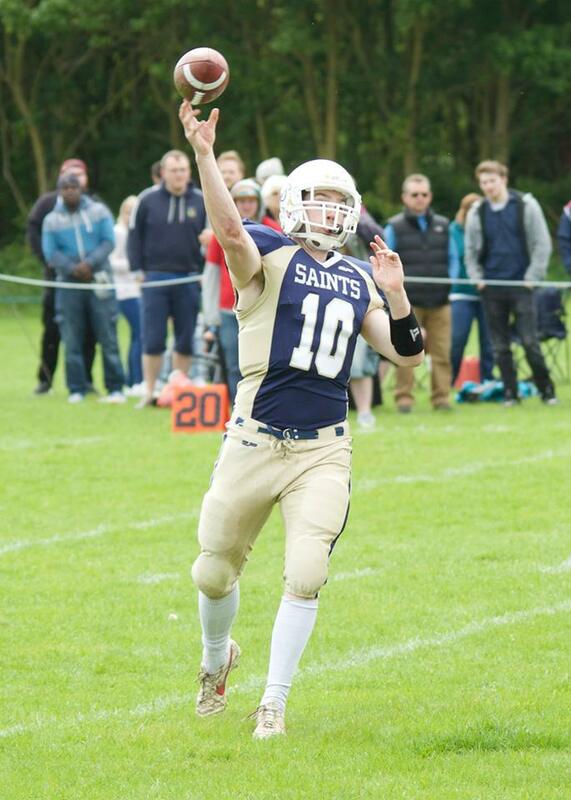 First year quarterback Ben Denton led the Saints offense onto the field and went to work. On only the 2nd play of the drive, Denton looked to throw the ball deep downfield and spotted veteran wide receiver Sam Armstrong near the endzone. The ball was on target as it sailed through the air until Sharks’ defender Alex Bonner jumped up to attempt the interception. Bonner got the ball in his hands but Armstrong was in the air right behind him and managed to wrestle control out of Bonner’s hands before they both hit the ground. A stunning play by Denton and Armstrong resulted in a Saints touchdown. Spencer Duffy attempted the extra point kick but it went wide to the right, 8-0 Oxford. The Sharks’ offense came back onto the field looking but still faced tough opposition from the Oxford defense. A 5 play drive gained them 21 yards but they were forced to punt the ball away again on 4th down. 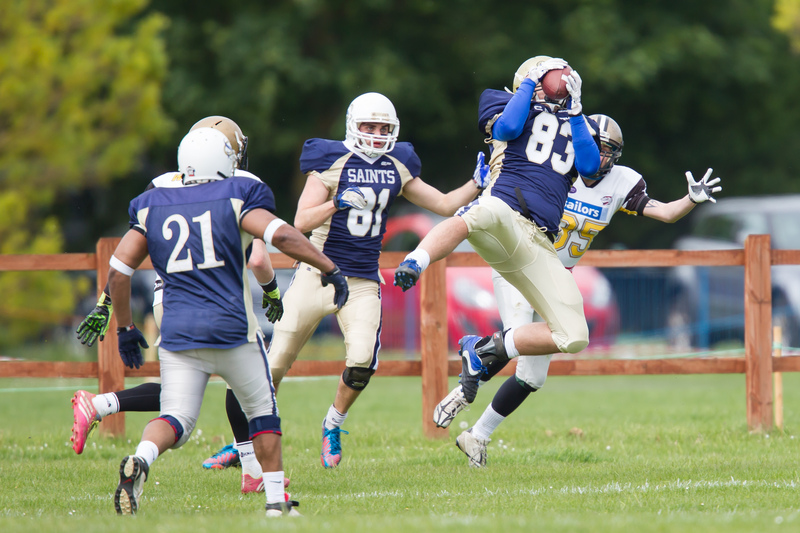 The Saints were driving well up the field on their next possession with hard running from Kev Brooks and Mike Oluwole. Oxford picked up 43 yards in 4 plays and were close to the Sharks’ endzone. A fumbled ball on the 27 yard line was recovered by the Sharks’ defense who took possession. Cornwall used the momentum swing to assemble their first strong drive of the game. The Sharks began moving the ball well with their runningbacks finding space to pick up first downs. On the 6th play of the drive, the visiting quarterback Perran Andrews found receiver Joseph Wolfenden-Brown and completed the pass. The receiver charged 50 yards down the field and into the endzone for a Sharks’ touchdown. The extra point kick was good, 8-7 Oxford. The Saints offense took over and continued to pick up big gains and move down the field. Reinforced by returning veteran Ian Harry at fullback, the offense was firing on all cylinders. Runningback James Walter was consistent as always and remained a problem that the Sharks were struggling to contain. 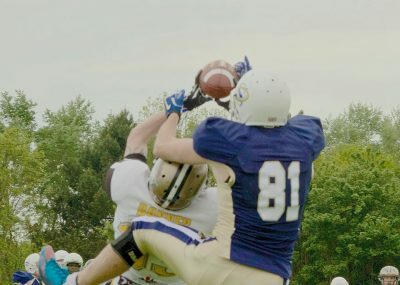 After moving into Sharks’ territory, Ben Denton fired another deep pass towards Sam Armstrong and although tightly covered by a defender, Armstrong managed to reel in another spectacular catch for his 2nd touchdown of the day. 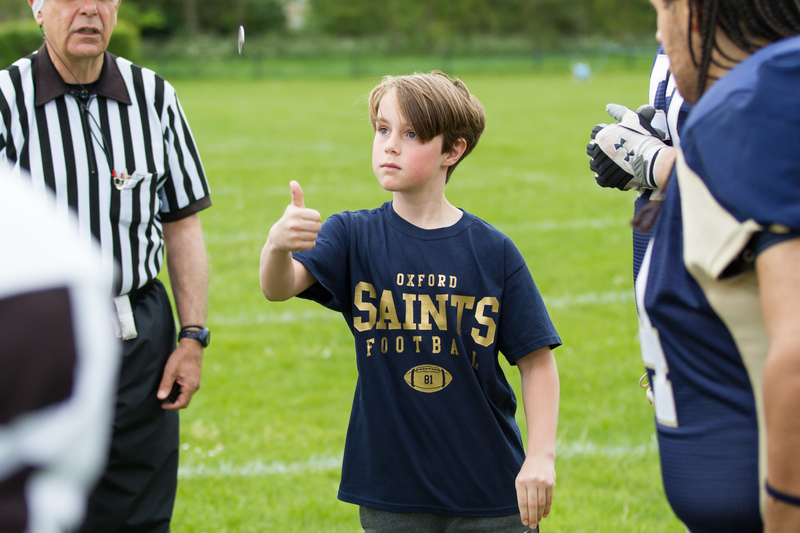 Duffy successfully kicked the extra point, 15-7 Oxford. In the 2nd quarter, Cornwall’s offense were making progress and a long 10 play drive took them 50 yards down the field. With strong defense by Oxford, the Sharks struggled to get another first down and decided to kick a field goal which was good. 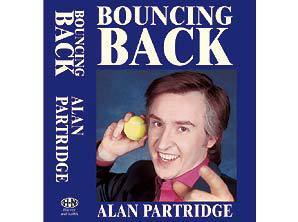 The extra 3 points narrowed the scoreline to 15-10 Oxford. A Sharks’ punt put the Saints deep in their own half and the offense began on just the 12 yard line. A tough display by the Cornish defense prevented the Saints from gaining much needed comfort space and the offense turned over the ball after failing to achieve a first down. With a short field, this set up the opportunity for the guests to take the lead. After 5 plays, Sharks’ runningback Shaun Griffin charged into the endzone for the score. The extra point kick by David Kriehn was good and the lead changed over, 17-15 Cornwall. Being down at half time is starting to become a trend for Oxford, who are developing a habit of staging much improved 2nd half performances. This game was no different, with a 2nd half which was mostly non-stop Saints. 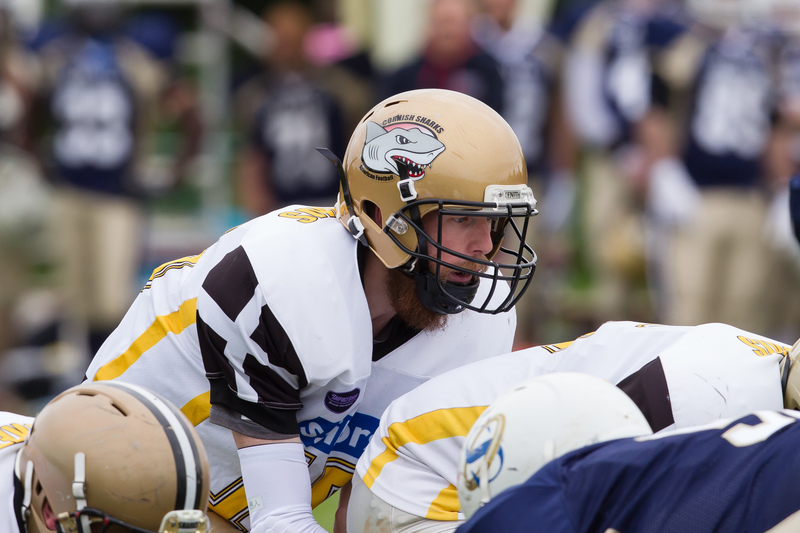 Shark’s quarterback George Evans took over from Perran Andrews. 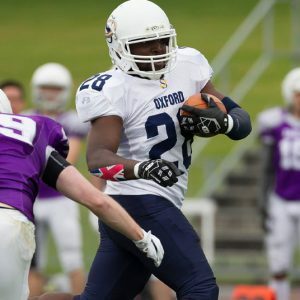 A long drive by Oxford was plagued by numerous penalty flags against both teams, but hard running from Kev Brooks, Mike Oluwole and Ryan Kingshott contributed to a 88 yard drive across the field. 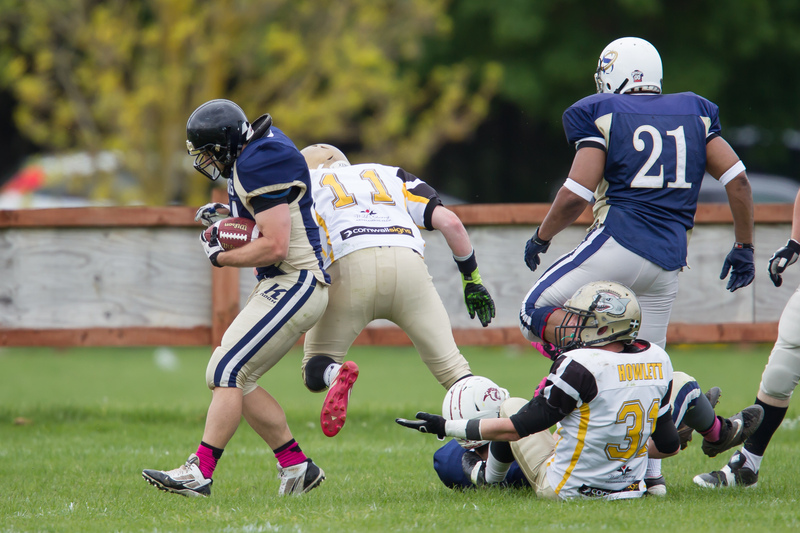 Ryan Kingshott smashed into the endzone for the score. After initial celebrations, the sideline fell silent when it was feared that Kingshott had suffered a significant injury in the process and was unable to move from the floor. After being attended to by the Saints medical staff, Kingshott was able to stand up and leave the field, to applause by both teams and spectators. Oxford attempted the 2 point conversion and Ben Denton dropped back as he looked to pass the ball. Good protection from his offensive line allowed Denton time to hit tight-end Rich Bloomer for a leaping grab. The 2 point conversion was good and the home team had taken the lead once again, 23-17 Oxford. On the following kickoff, Spencer Duffy sent the ball deep to the Sharks who pulled off an impressive return. Their kick-returner Richard Howlett found room up the sidelines and travelled the length of the field into the endzone for the score. David Kriehn kicked the extra point and the Sharks inched forward, 24-23 Cornwall. Ben Denton and the Saints offense went to work and quickly restored the lead for the team. James Walter continued to haunt the Sharks’ defense with his powerful running and picked up several first downs on a long drive for Oxford. Completed passes to Rich Bloomer and a 18 yard reception by Sam Armstrong brought the Saints within range of the Sharks’ endzone. Denton handed the ball off to Walter who charged up the middle for the score. 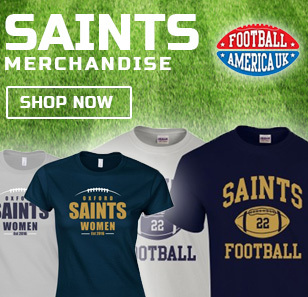 The Saints went for the two point conversion again and Walter ran the ball in himself to add another 2 points. 31-24 Oxford. Beginning the 4th quarter, the Saints defense led by captain and veteran linebacker Dean Bryan continued to express their authority on the game. Throughout the contest, Bryan himself had one of his best games and tallied up 14 tackles. As the Sharks looked to claw back the lead, on the 2nd play of their drive quarterback George Evans was sacked by defensive end George Wright, losing the Sharks 6 yards. 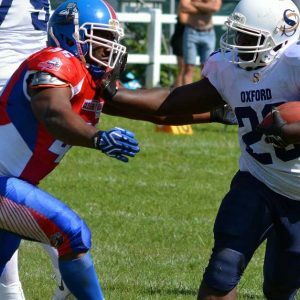 On Oxford’s next possession, James Walter remained on form and broke out a huge 74 yard touchdown run, scoring for the 2nd time of the day. The 2 point conversion attempt was no good, 37-24 Oxford. The Sharks continued running the ball and and a 9 play drive saw them picking up only 23 yards, struggling against the tough Saints defense. Linebacker Dean Bryan continued to marshal the defense well and fellow linebacker Calvin Holmes landed a big sack on George Evans for a 12 yard loss. 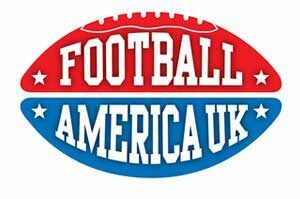 The Sharks attempted to convert on 4th down but were unable to gain the yards they needed and possession of the ball reverted back to Oxford. With good running by Kev Brooks and a stunning 30 yard reception by 2nd year receiver Leroy Holmes, the Saints were knocking on the door once again and poised to score. A huge sack on quarterback Ben Denton set the Saints offense back 10 yards and two incomplete passes resulted in a turnover on downs. On the 14 yard line with their own endzone right behind them, the Sharks desperately needed to move the ball down field and give themselves breathing room. On the first play of their drive, a fumbled ball hit the ground and Oxford linebacker Luke Fry dived on it to reclaim possession. 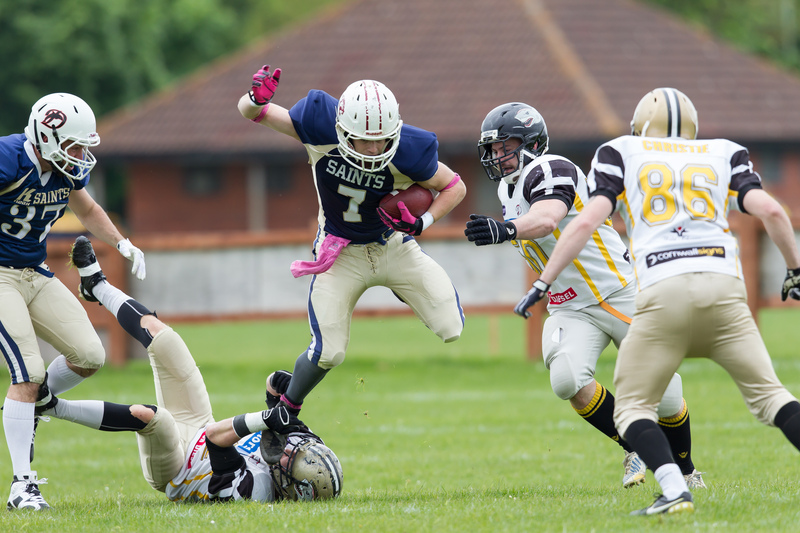 This gave the Saints excellent field position and Denton handed the ball to Kev Brooks who looked certain to score. Being tackled just short of the endzone, the ball was shook loose and rolled into the endzone. 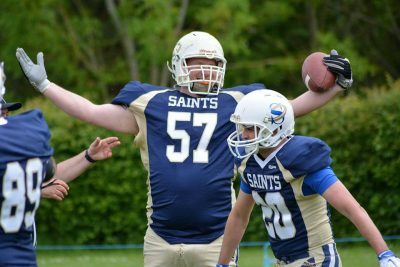 As a live ball, it could be recovered by either team but it was Saints lineman Stuart Cribbes, a veteran of 20 years, who charged over and dived on the ball to score the first touchdown of his career. 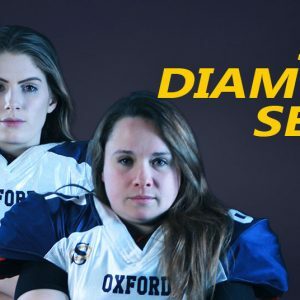 The 2 point conversion attempt failed, 43-24 Oxford. 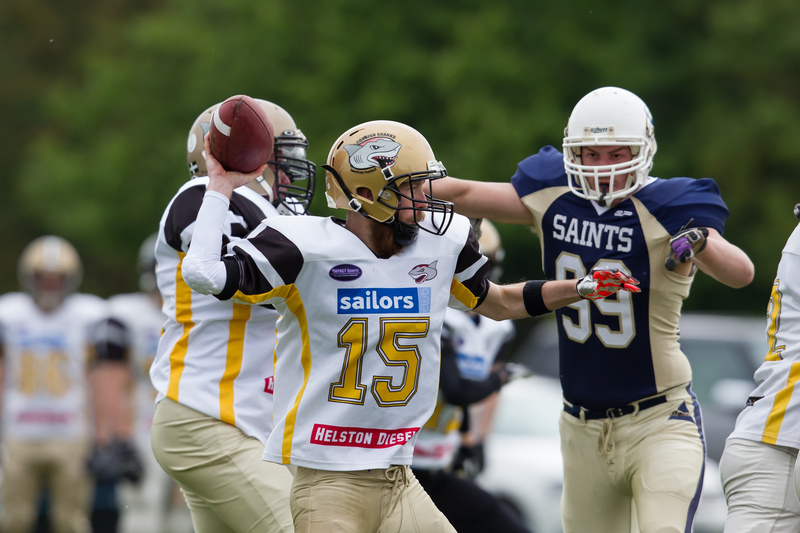 With victory all but certain, the Saints continued to place pressure on the Sharks. The visitors had struggled to make any significant gains throughout the 4th quarter and with time running out, rookie defensive lineman Graham Henley landed another sack on George Evans who had suffered his 3rd sack of the day, this time for an 11 yard loss. 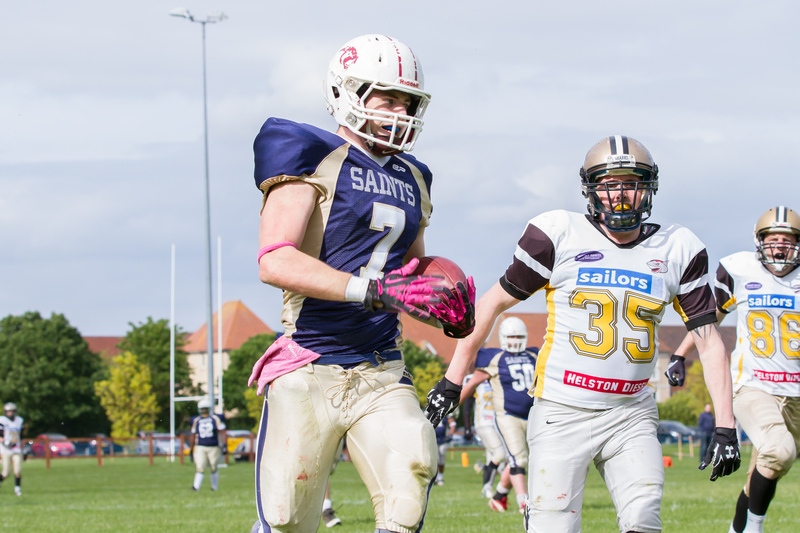 At the end of the contest the Saints claimed a 43-24 victory and move to 3-1 on the 2015 season. 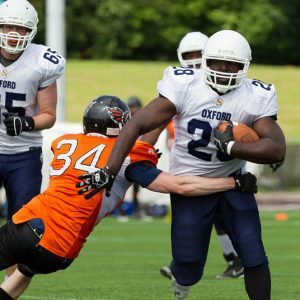 When reviewing the statistics for the game it is clear that it was Oxford’s continued ability to run the ball hard and fast which contributed to the win, combined with a determined and experienced defensive unit. The Saints claimed 434 yards in total whereas the Sharks notched up only 170. 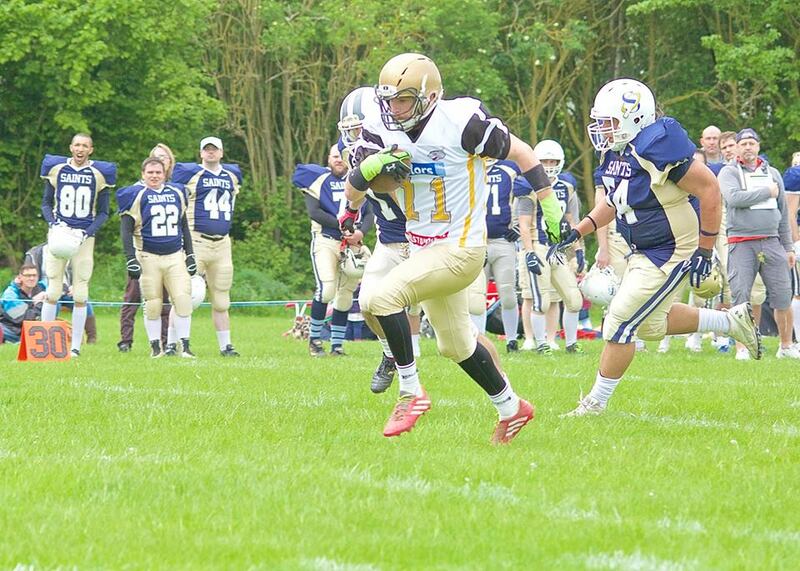 James Walter had 15 carries for 147 yards and 2 touchdowns. Kev Brooks had 14 carries for 112 yards. Sam Armstrong led the receivers with 3 receptions for 72 yards and 2 touchdowns. In the air, quarterback Ben Denton attempting 11 passes and completed 7 for 130 yards, 2 touchdowns and one 1 interception. Dean Bryan led proceedings with 14 tackles (8 solo and 6 assists), followed by Martin Fitzpatrick with 5 tackles (2 solo and 3 assists) and Connor Day with 5 tackles also (2 solo and 3 assists). 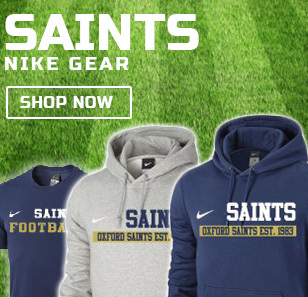 Sacks came from George Wright, Calvin Holmes and Graham Henley. 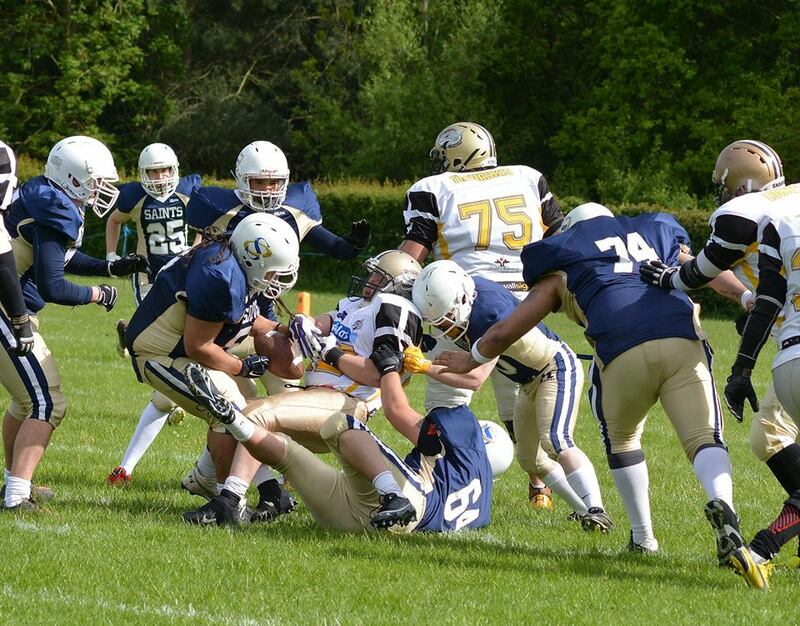 On Sunday 24th May the Oxford Saints travel to Torbay to take on the Trojans.